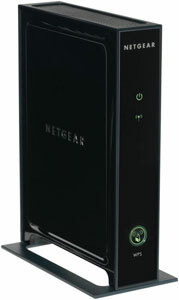 Netgear this month released its version of a wireless 3D HD networking home theater solution as part of its Netgear AV Series. According to Netgear the new 3DHD Wireless Home Theater Networking Kit (WNHDB3004) is capable of delivering jitter-free 1080p high-definition video streaming throughout a home. The transmitter and receiver are built with MIMO (Multiple-Input and Multiple-Output) technology to offer the best possible performance from some of the most demanding applications and systems. The 3DHD Wireless Home Theater Networking Kit doesn’t need a specialist to install. After unpacking the kit one adapter (the transmitter) is connected to the home router or gateway via an Ethernet cable. Other adapters then act as receivers, each providing connections for up to four Ethernet-enabled devices such as video game consoles, televisions, broadband set-top boxes, Blu-ray players, digital video recorders, digital media adapters and computers. "We created 3DHD Wireless technology to keep home networks from becoming a bottleneck for such demanding streams, while eliminating the expense and effort of running Ethernet cables through walls, floors and ceilings. This makes 3DHD Wireless technology an ideal solution for consumers, professional home theater installers and broadband service providers." said Som Pal Choudhury, NETGEAR director of product marketing for Core Networking Products. The NETGEAR 3DHD Wireless Home Theater Networking Kit (WNHDB3004) with two adapters has a manufacturer's suggested retail price of $259 in the United States and will be available worldwide in mid-November, while additional individual adapters (WNHD3004) have a U.S. MSRP of $129.